We made a fun project awhile back that I never got around to writing about. Thankfully, I took photos during the process and I came across them the other day. 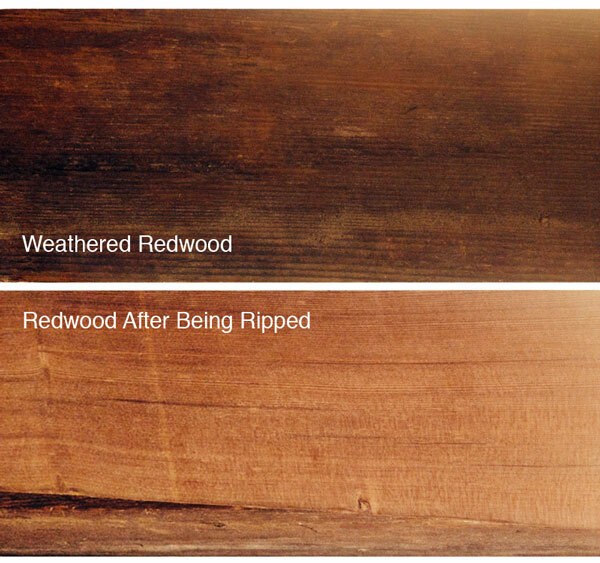 Our co-founder, David Jochim, was redoing his back patio and ended up with a lot of weathered redwood from the old decking. He brought it into the office and wanted to do a project with it for his patio. Redwood carves very nice, so there were many ideas discussed. His new patio is an exciting place. He likes to entertain and wanted to have a fun space for his kids. 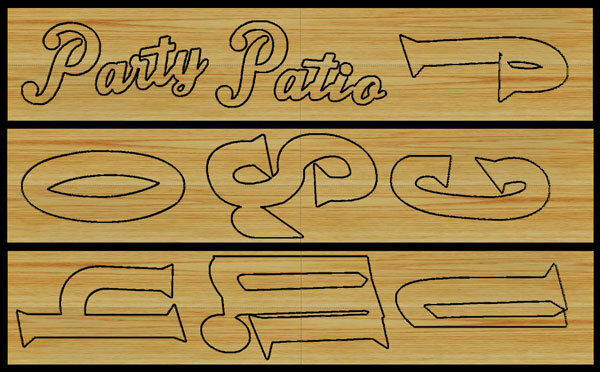 Along with a pool, there is an air hockey table, tiki lamps, a bamboo bar, and other beach themed decor. 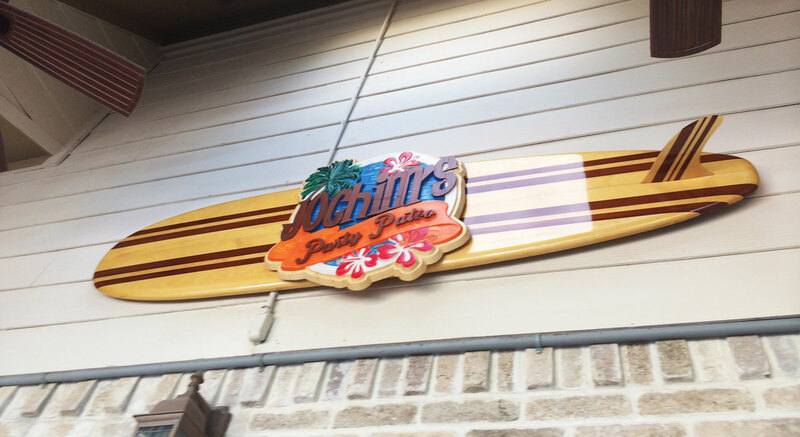 Taking a look at the whole picture, it was obvious we needed to make a surfboard sign. Surfboards are long and wide. Too wide for the machine to carve in one piece. We worked out the dimensions and decided on 88 inches long and 22 inches at it’s widest. 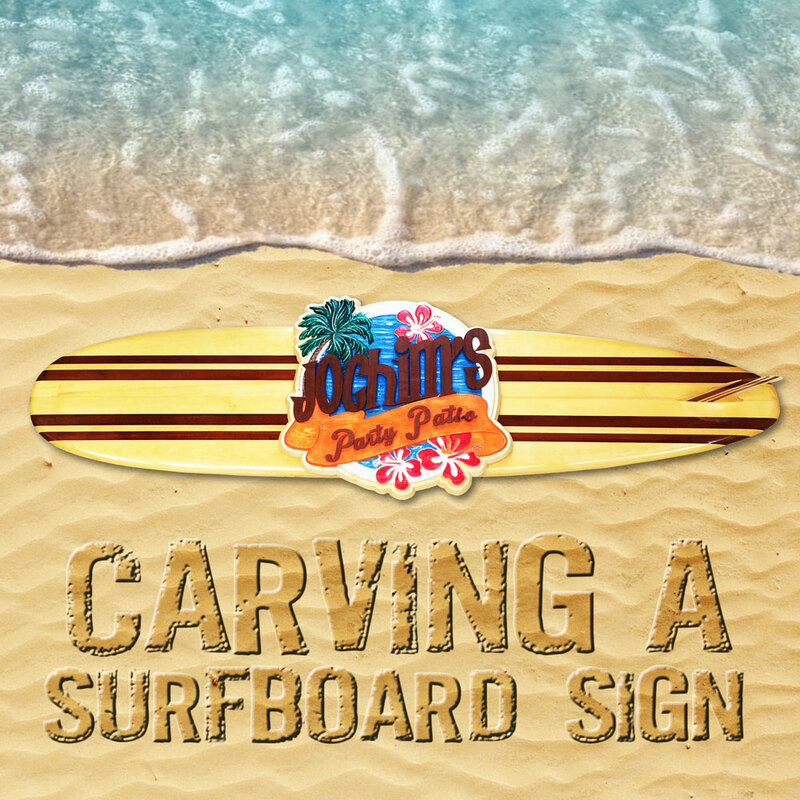 To do this, we would need to carve the surfboard in 2 pieces and glue them together. 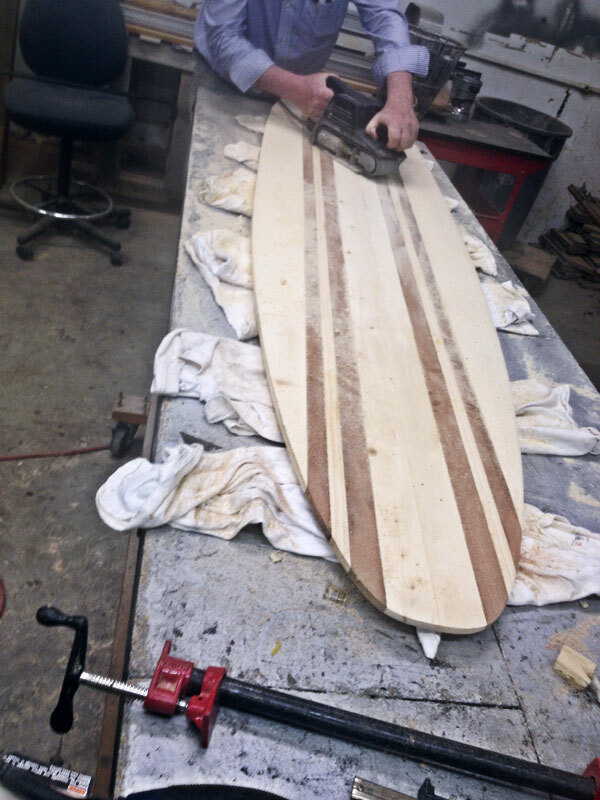 With the dimensions in hand, we started to create our boards. 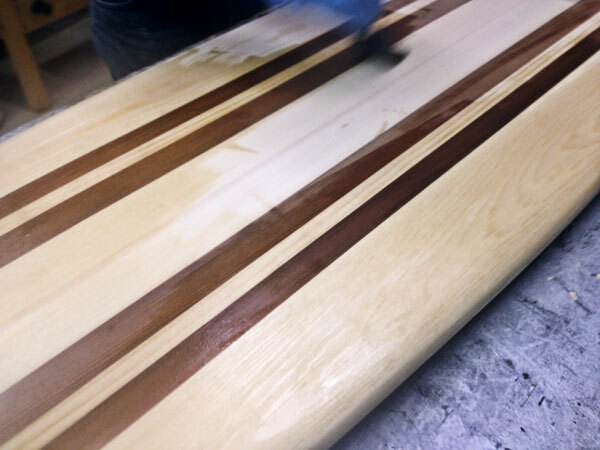 We decided to use the redwood along with some white pine to make stripes. 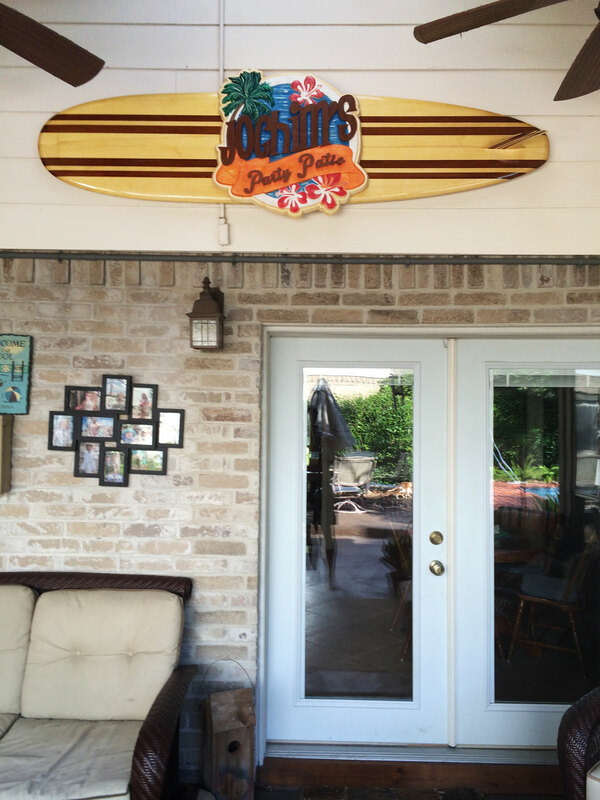 Since this was to hang on a wall, we decided to make the surfboard only one-sided. 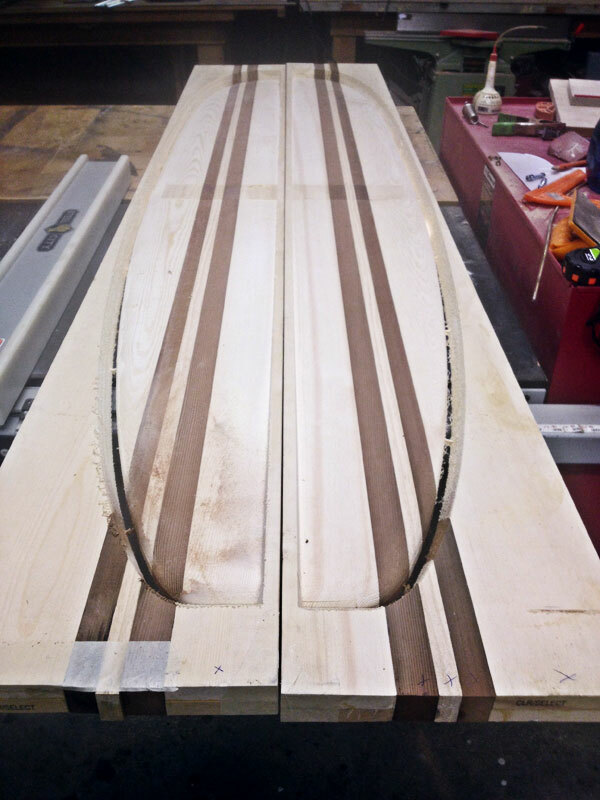 We could have carved both sides giving it the full contours of a surfboard, but we felt it just wasn’t needed. 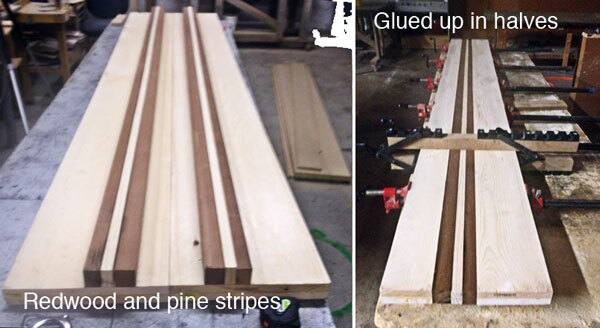 We glued 2 – 3/4 inch pieces of pine together and ripped the redwood to match the 1.5 inch thickness. Then, we just used a 1×2 piece of pine for the stripe in between the redwood. 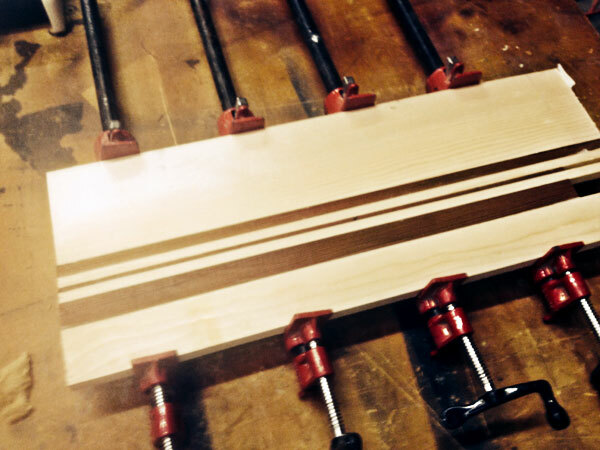 Once the dimensions were decided and cut, we glued it together making two boards 12 inches wide by 8 foot long. After the glue was dry we still need to sand everything to get the boards nice and flat. Next, it was time to create the project in Designer. 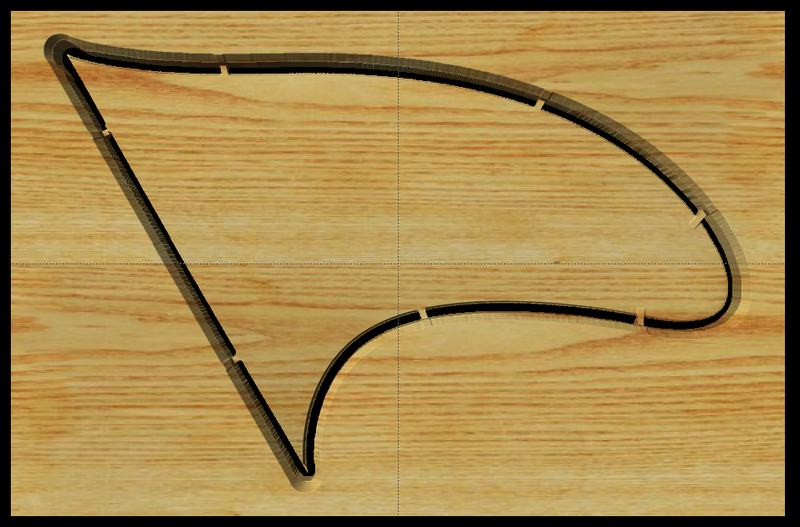 I used dimensions from surfboards I found online to create the shape by tracing an imported image. I did this on a smaller scale so I could make the entire surfboard on a 15 inch wide board. Then, I used the extrude tool in the Pattern Modeling Suite to create the arch from front to back, and merged that with a sweep to round the edges. 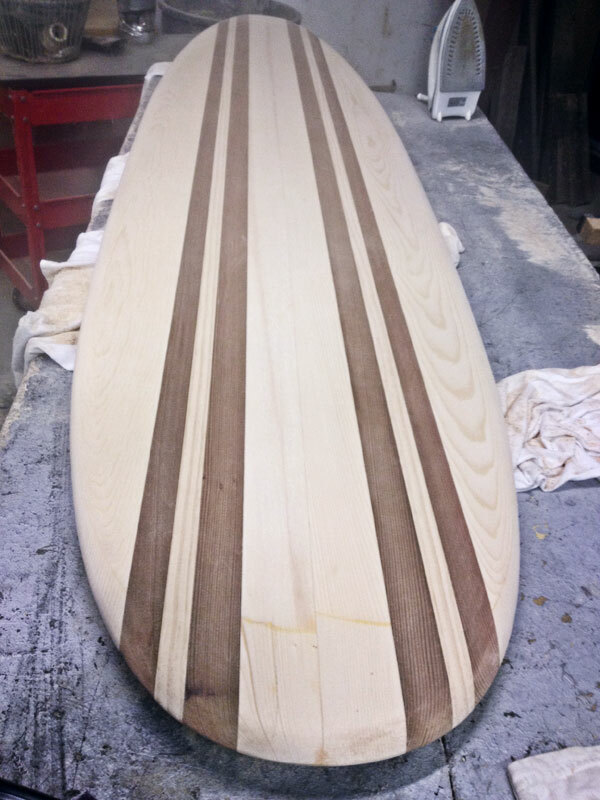 Once the overall shape was made, I made it onto a pattern and scaled it up so half of the surfboard was off the board. Last, I added a pierced edge and tabs to keep it all secure. 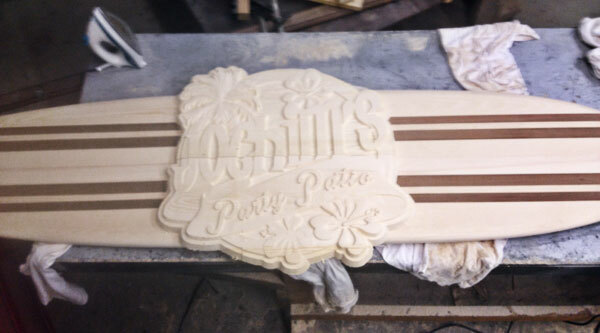 To make the other half, all I needed to do was flip the design lengthwise and I had both surfboard halves ready to carve. I uploaded the project file and went to carve. Since these have no real detail to them and I wanted to keep the time as low as possible, I carved it all on Draft with the 1/8 inch Long Carving Bit. They still took 12 hours each to carve! They carved perfectly, though. I separated the pieces from their tabs and glued them together. Next step was to sand and sand some more. I created the fin for the surfboard, next. This is a 2 sided carve at 3/4 inch thick. I glued up another striped board for this. 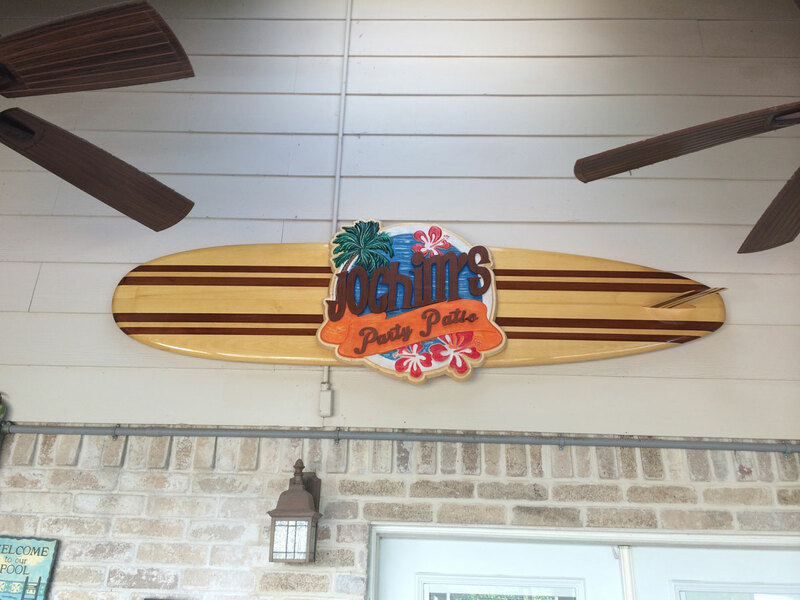 The idea for this project was to include a sign that sits on the surfboard. I laid it out in Designer and sized it up to split into 2 halves. 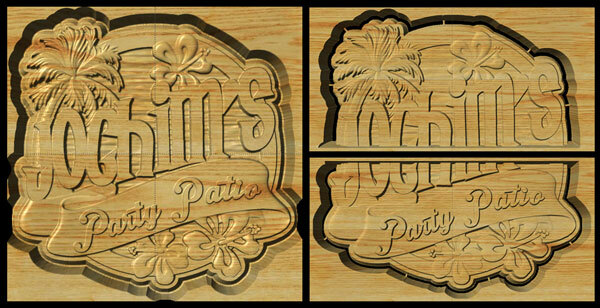 I took these to the machines and carved them into 2 – 1×12 white pine boards. 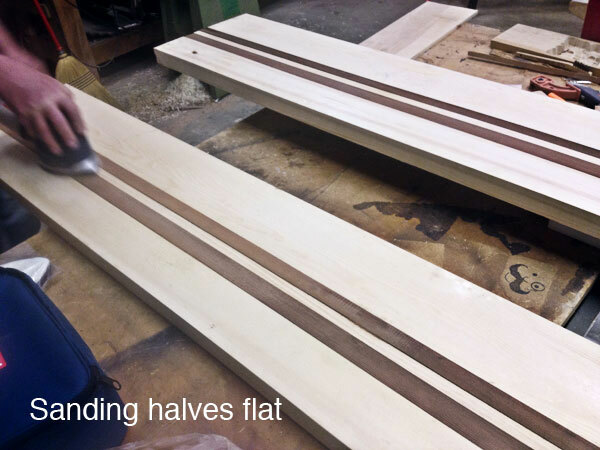 Once carved, the halves need to be separated from their boards, glued together, and sanded. Once all the pieces are prepared, it’s time to start finishing. 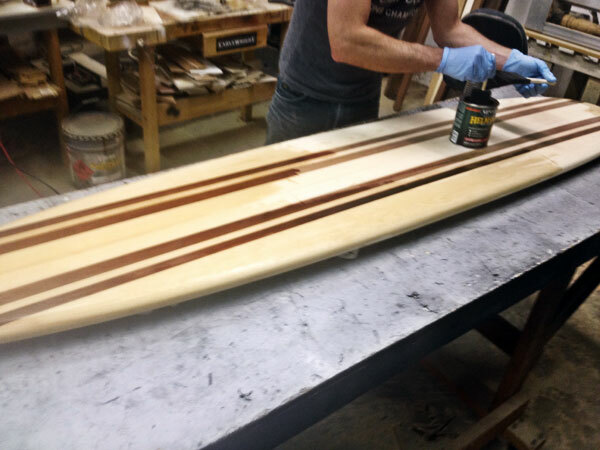 For the surfboard, we applied a marine spar urethane to get the deep polished luster of a real surfboard. This took multiple layers and lots of wet sanding. 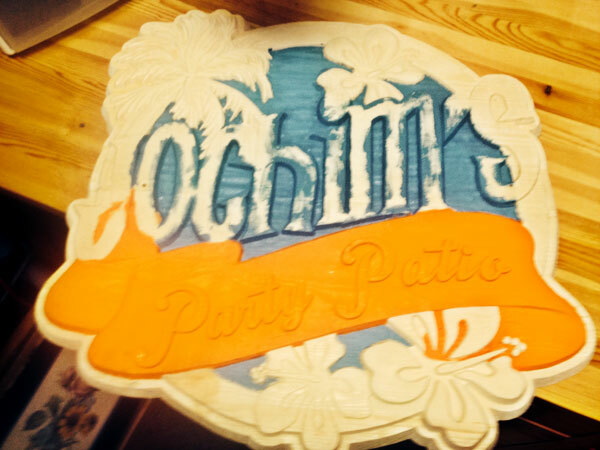 We wanted to paint the sign to get some bright beachy colors into this. First, we needed to prime it front and back with a sanding sealer and then we just used some acrylics to lay some colors down. At this point, we decided on cool way to finish the letters on the sign. We had re-sawed the surface of a 2×6 piece of redwood in order to see the color of the wood underneath, and we ended up with a 1/8 inch thick piece of redwood. I decided to cut the lettering out of this piece to glue onto the sign’s lettering. Before gluing the letters on, we went at the paint job with some sandpaper to weather it a bit. Then, to finish it, we applied a urethane clear coat to the entire sign. 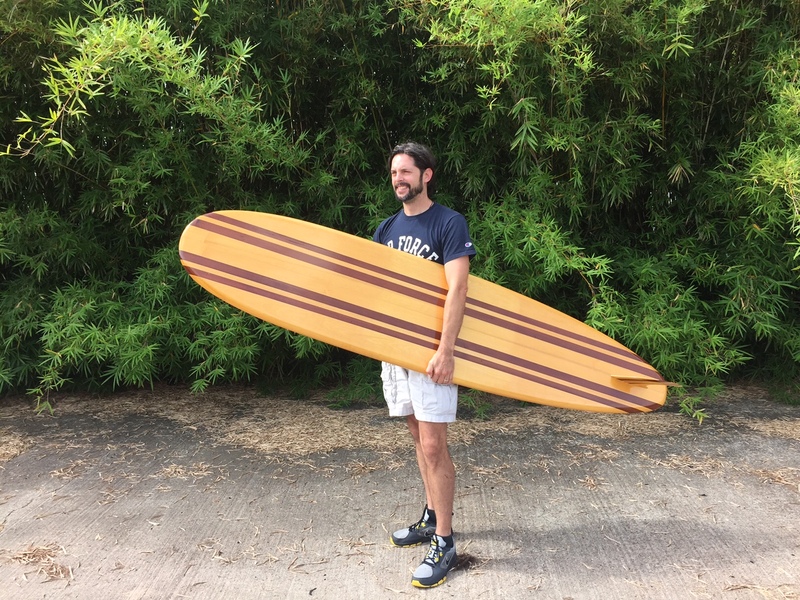 The sign part is actually hooked onto the surfboard, so these can be separated for transportation, and for when David wants to pose with his surfboard. 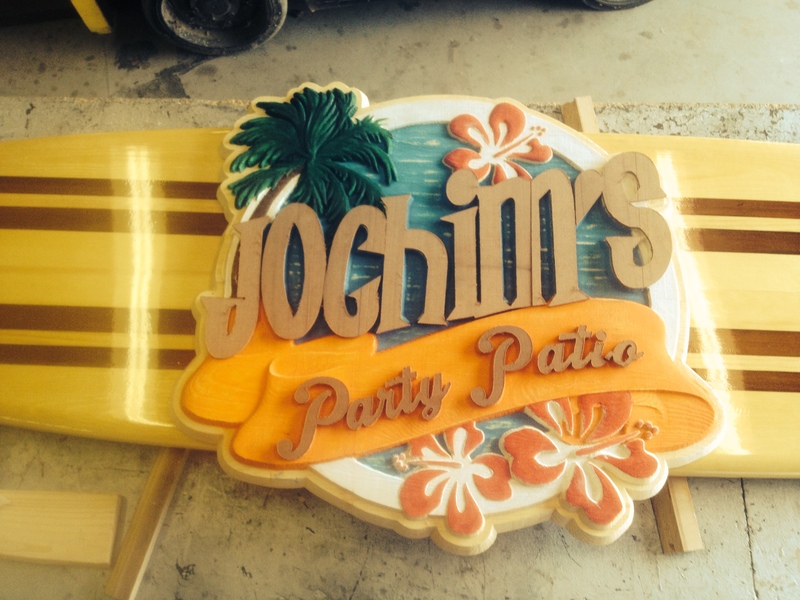 The finished sign installed in the Party Patio. Thanks for reading. If you’d like to try this project on your own, or are just curious about how the files were laid out, I’ve made them all available for FREE below. Designer PRO 3 is required to open the files.